T.O.401. 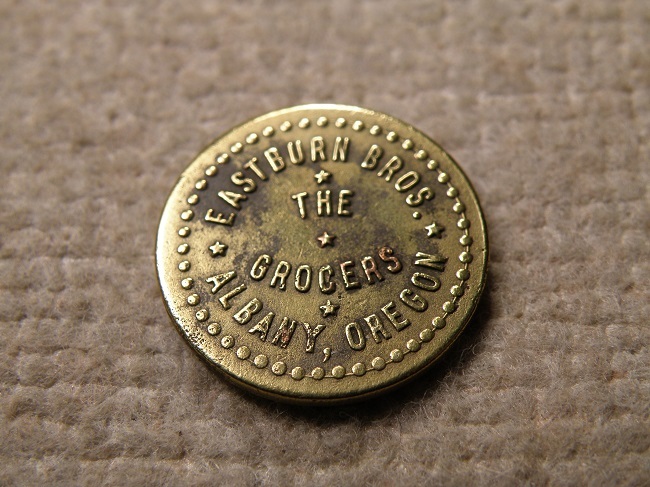 An attractive Oregon cow ear tag token in nice condition. (holed) Hecker Bros./Albany, Ore. Rd B 24mm. T.O.856. An attractive Oregon token in nice condition. Moose Club No. 859/10¢/Albany/Ore.// Order of Moose. Round, Brass and measures 24mm. T.O.216. An attractive Oregon token in nice condition. Townsend's Grocery/Second/&/Montgomery/Albany,Oregon//GF/10¢/IT. Rd A 18mm. T.O.206. An attractive Oregon token in nice condition. Ashland/B.P.O.E./944.//GF/5¢/IM. Oval B 18x26mm. T.O.205. An attractive Oregon token in nice condition. Ashland Lodge/12½¢/No 944 B.P.O.E.//12½. 4 sc A 28mm.